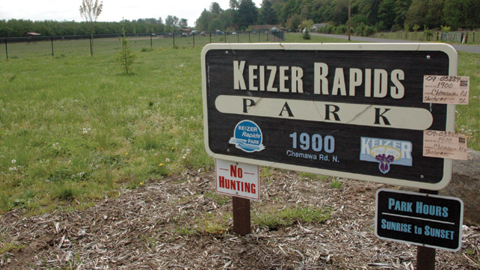 New rules for smokers, drone operators and reservable areas of Keizer were all discussed at the most recent meeting of the Keizer Parks Advisory Board Tuesday, May 8. The rules were not put up for a vote during the meeting, but will return with some additional changes at the board’s next meeting. Members of the board overwhelmingly approved a smoking ban in Keizer parks in February and changes to parks rules, which were under review at the meeting, including new language banning the ignition or smoking of tobacco products or legal or illegal drugs. Aside from requesting additional language banning vaping, the new rule went largely uncommented on, aside from a question about marijuana edibles. New rules clarifying first-come, first-served policies and reserving specific park amenities generated more conversation. Johnson said language in the new rules is meant to clarify usage specifically at the Keizer Rapids Park Rotary Amphitheater and in other areas when events require electricity or amplification. “You don’t get exclusive use without a permit,” said Johnson. “If it’s over 100 people you need to reserve a space, and if you have more than 50 people, you need to get a permit.” Permits and reservations are processed through the city. The new rules also designate that specific areas of a park can be reserved for use. Whether park users have permission to fly drones in parks was another hot topic. The city already has rules barring usage of remote- or radio-controlled vehicles, but drones are a relatively new addition to the field and even the Federal Aviation Administration (FAA) is still hammering out applicable rules. Board member Matt Lawyer, a program manager for the Oregon Department of Aviation, offered up two possibilities. Johnson said he favored a more restrictive option for the time being. “It’s harder to make something more restrictive and easier to make it less restrictive, but we would include a provision for the parks or public works director to make exceptions for something like a (drone-centered) event,” Johnson said. Board members, led by Zaira Flores Marin, requested more time to research the issue and review any language Johnson puts forth. The board will also be reviewing fees associated with rule violations. Johnson’s first pass at setting fines, which would mean a minimum $75 fine for smoking or setting a fire, left at least one board member wanting. “I would like it to be consistent with the violation classification,” said Donna Bradley.